Your plumbing system is a huge part of the comfort that your home needs to provide to you and your family. When your drains become clogged, all of your home's plumbing fixtures can be less efficient, and your plumbing system can become very inconvenient to use. Many homeowners try using store-bought drain cleaning products to remedy this problem, but this solution is temporary as best, and it doesn't begin to compare to the services that the professional plumbers at Franklin Plumbing & Drain Cleaning can provide you with. Your plumbing system's drains need to be in great shape in order for your plumbing to work properly, so when you need to have your drains cleaned, you need to know that you're getting the best work possible. Compared to professional drain cleaning services, store-bought drain cleaners are much less effective, they're often toxic, and they can end up doing more harm than good to your plumbing system. Our professional plumbers will be able to remove any obstructions and clogs in your drains and pipes without any of the toxic substances that many store-bought cleaners are made from. We'll also be able to guarantee a totally thorough drain cleaning, which store-bought chemicals can't do. Store-bought drain cleaning products won't be able to remove obstructions in your clogged drains as effectively as a professional plumber. These solutions are typically corrosive substances that are intended to dissolve the obstruction. Once a small area of the drain clog has been dissolved, the solution will be able to flow past the problem area, and much of the obstruction will be left in your home's drains. 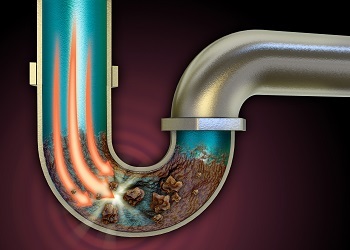 When we provide you with professional drain cleaning services, we'll find all of the obstructions in your pipes, then remove them completely. With store-bought chemicals, the clog isn't completely removed, and it will continue to collect particulate matter and lead to a cycle of of slow and clogged drains. The toxicity of store-bought drain cleaners is another major problem. They're usually made of unhealthy materials such as acid, caustic substances, and basic solvents (i.e., bleach, lye, peroxides, potash, and nitrates). These substances can be very harmful if they're swallowed and may cause severe damage to your skin and eyes. Store-bought drain cleaners are also corrosive, and they may end up damaging your home's plumbing system. Metal plumbing can start to break down after coming into contact with these substances, especially if you're using them over and over again. PVC piping is also likely to be damaged by these chemicals. If you've been dealing with clogged drains or pipes in your home, our plumbers can provide you with thorough drain cleaning services. The problem will be completely eliminated, and your plumbing system and all of its fixtures will be able to work properly and efficiently. Do you need drain cleaning services in Columbia, SC? Call 803-799-2222 or complete our online request form.